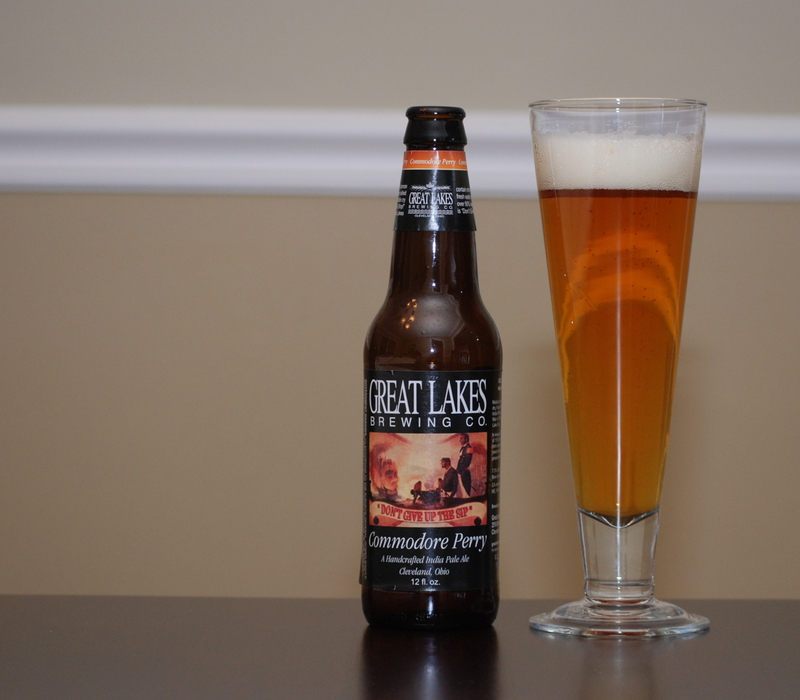 Great Lakes Brewing Company’s Commodore Perry IPA is named after Commodore Oliver Hazard Perry, the naval hero of the War of 1812 who battled the British navy on Lake Erie. The beer which bears The Commodore’s name is brewed with two kinds of malt (Harrington 2-Row Base Malt and Caramel 30) and two kinds of hops (Simcoe and Fuggle). Since I’m not a brewmaster, I have no idea what any of this means. I just hope it all leads to a tasty beer! Appearance: Pale Orange. Fluffy, slowly dissipating one inch head. Moderate lacing. Clear, rapidly rising bubbles. Aroma: Orange zest. Sweet honey. Definitely hoppy, but not as much as your typical American IPA. Taste: Medium carbonation. Slightly sweet at the start with light brown sugar and honey flavors. Hop bitterness starts to build. Pleasantly bitter finish that tingles your palate. As I have previously reported, freshness dates really matter when it comes to the Great Lakes Brewing Company! Since they don’t use any preservatives, their beer has a much shorter shelf life than most other beers. Luckily, this batch of Commodore Perry IPA had an “Enjoy By” date of 3/23/2011, so freshness was definitely not a problem. This is a very delicious and well-balanced beer. It definitely has that classic IPA hop bitterness, but there’s just enough sweetness from the malts to keep it from being overwhelming. This isn’t my favorite IPA, and it isn’t my favorite Great Lakes beer (love the Burning River Pale Ale and Edmund Fitzgerald Porter! ), but it’s still a very good beer that I will definitely purchase again. Once again, well done Great Lakes! I fully agree with this, the commadore perry ipa is an above average ipa. I find it an easy drinking ipa as well. But along the lines of great lakes beers its not my favorite as well. But great lakes has been a solid beer maker. I enjoy just about every beer they make to an extent.